Here’s something I surely did not expect to happen: the director of El Topo and The Holy Mountain and the would-be director of a mind-blowing Dune adaptation Alejandro Jodorowsky would help me heal my life. Now I do not claim to say that he changed my mind or got me to see the light singlehandedly (there were various other conscious and unconscious life-long processes at work) but I can firmly state that it is with his help that all the myriad pieces have finally come together and clicked so-to-speak. But to provide much-needed context, let us rewind to the dawn of this year. 2017 is a year I sometimes jokingly but half-earnestly call a veritable crapfest. It ranks high among one of my most uncomfortable years to date. I am not (only) talking about the world at its current state with all its political turmoil constantly and incessantly swirling around us but more about my own mini-world, the micro-fabric of my existence, also known as my personal life. To put it bluntly, it was not good (but of course it goes without saying that it could have been worse). My year began with gum / teeth pain on two separate locations of my mouth, both of which had become infected and had to be extracted, as a result. It is painful to lose one’s teeth; as a teenager I had to endure numerous extractions among which there were four adult teeth that needed to be sacrificed in order to make room for the other ones; yet now, there appeared two other much more visible gaps in my mouth (but thank God they are on the less noticeable back-row sections). It was during the same time perhaps caused by my infection or perhaps even being the very cause of my infection that my blood sugar skyrocketed making me prediabetic / diabetic since then (the marking line between the two I find rather confusing). That on its own would have been enough to make my hair stand on end but add to that problems in the form of unjust treatment at work, all of which culminated in my loss of extended health benefits (ironically when I needed them most). This dangerous cocktail sent both physical and mental health down the drain. This all-out stress was hard to bear, and my sleep took a temporary dive; there were days where I had to function on a few hours of sleep and in some extreme cases with no sleep at all! It was with immense discipline, patience and stamina that I managed to get through my tasks successfully despite all the storms around me both within and without. I hung in there like a lost and dazed kitten praying and yearning for better times. It was the advice of the wise Tarot (which I have been duly and diligently using and practicing for almost three decades now) that gave me strength through these somber and anxiety-inducing days as I was promised better times ahead; the cards spoke of a time where I would be better able to handle my stressors and get (more or less) regular sleep. They also told me that I would be vindicated and that with patience I would be able to right the wrongs that had occurred to me at work and would, as a result, achieve a peaceful mind. This did indeed happen later this year and helped me to overcome and clear the hurdles and the harmful gossip that had accumulated over time. It was a profound sigh of relief. I felt much better overall but had also made the conscious decision and promise to take my health more seriously and more firmly into my own hands. I started to portion my meals, walk almost daily for close to an hour, exercise in the form of dance (don’t ask) and over the past few months I managed to shed some five kilos. It is a drop in the ocean, but it is at least something to hold onto and to continue over the next foreseeable future. On one of my semi-idle days (which was rare but I had an unexpected break between two classes) I ventured into the main municipal library and browsed through the French section. I was looking for the essays of Michel de Montaigne, some of them I had studied during my grad years with great interest and I felt that they could help me to improve my posts in one way or another. But I did not find that specific book. Instead by sheer accident or coincidence (in neither of which I actually believe in), I stumbled upon (or rather were guided to) the book Manuel de Psychomagie by none other than Alexandro (French spelling of his first name) Jodorowsky. Now that certainly looked interesting! A few pages in, my eyes fell on the cursive unofficial subtitle, Tips to Heal your Life and I thought of giving it a try. I hesitated at first because my impression of Jodorowsky had been that of a brilliant director who was also a nutcase (the two of which, more often than not, end up going together). But somewhere in the back of my mind, I did recall that he was an ardent believer and practitioner of Tarot cards and that swayed and steered my mind favorably in his direction. When I started reading this book, I was more than impressed, to put it mildly. It is like reading a psychoanalytic self-help book but on acid. I must admit here that although I have admiration and a certain fondness for psychoanalysis, I had never taken it completely seriously. One thing we often overlook is that Sigmund Freud was not only a psychiatrist but also a neurologist. He knew about the physical and biological processes even though his form of analysis is often labeled as not fully grounded in science or even haphazard; in short, it is often regarded as a (mere) creative endeavour and sometimes put on the same footing as astrology, for example. The stereotypes and some random quotes picked out here and there and the (seemingly) rampant obsession on themes of sexuality running through his theories have not helped in this matter to make his theories resonate as much as they should. 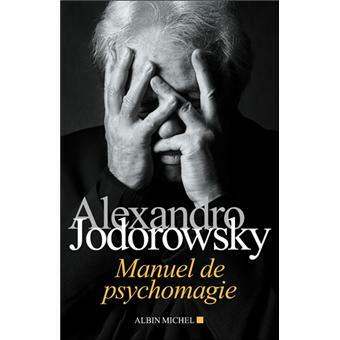 But I think that this book by Jodorowsky helped me break through the barriers of my own ignorance and prejudices vis-à-vis this type of therapy. In fact, Jodorowsky uses psychoanalysis as a psychological and philosophical starting point towards self-realization and then takes it a step further. As you may know, psychoanalysts usually dig up the person’s past and scan for childhood traumas; this in turn would help or at least facilitate the clients to shed light upon and re-examine their neuroses or issues at hand. This can be achieved in various ways, either through free association (the client on the couch spontaneously talks about whatever comes to their mind) or a sleep journal or even vivid and lingering memories that resurface from the past. The main reason why there is so much focus on childhood is because it is one of the most impressionable stages of one’s life. At that point, we are at our most fragile state of being depending not only physically on our survival but also mentally. These memories (sensations, impressions, thoughts, experiences) are then engraved in our mind and play a significant role in our unconscious. The unconscious then is really our basement, a repository in which we accumulate and keep track of our most cherished as well as most despised thoughts and feelings. Our consciousness, this would be the executive acting agent referred to as the ego, will try to protect us especially from the negative stuff; the ego will attempt to keep traumas down there in the basement for as long as possible. However, as we all know from daily experience, repression does not solve the problem. These unwanted thoughts fester and grow in the unconscious and will spring up unexpectedly, either in dreams as nightmares or in the form of neurotic behavior. Psychoanalysis helps to give insight to the client and unearth these feelings that then explain why one has certain phobias. This could be, for example, a fear of being criticized or judged or of consistently choosing the wrong partner in one’s romantic life. The answer lies and is rooted more often than not in one’s unconscious. But this is where psychoanalysis would generally stop. You may realize that your abhorrent and abnormal fear of being criticized goes back to your childhood due to steadily nagging parents or that the fear of losing a job equals, at least in your unconscious parts of your mind, that of losing approval, hence the love and affection of your parents. Once you realize this, you will re-frame your perspective and see everything in a new light. This new way of seeing and understanding the world will help you towards healing from those traumas and to live a more authentic and less stressful and less neurotic life. But what Jodorowsky proposes, and this is where the magic and his creativity bordering on surrealism come into play, that realization is not enough but actions are needed to resolve these issues. Let us say, you have hatred for your boss – which is in turn a reflection and your own projection of a parent - you need to do something about that. The good news is that the unconscious is usually satisfied with symbols or symbolic actions. Thus, to vent your anger against the source (boss or parent), you do not need to resort to beating them up (something that is never advisable) but it would suffice to throw darts on their photos. The photograph is a symbol of the person, but the unconscious will feel relieved because it often confuses the symbol with its actual representation, that is, the map with the territory. Put differently, a psycho-magical act is one in which we heal our traumas via symbolic action. If you find yourself too attached to your mother, for instance, you can tie yourself to her with a (preferably silver, the color of femininity) ribbon and while pronouncing that you are grateful for all her care over the years but wish to become free and independent from now on, you will cut the umbilical cord. The accompanying words are equally important as any magician knows that Abracadabra is mysterious enough to add effect to the magical trick while prayers are utterances and words aimed for the ears of the Almighty. For each issue, there is a symbolic (and healing) response and the book is filled with many examples. Some of them sound outrageous and may appear offensive for some (keep in mind this is Jodorowsky we are talking about) but others are more than useful. In this way, he proposes a symbolic cure or fix for anything from shyness to jealousy to alcoholism and to even having problems at work. The difference between white or black magic and psychomagic lies in its focus. While the first two usually are done with the intention of influencing another person or a certain outcome outside of one’s reach, psychomagic focuses on the given individual and his or her surroundings. In other words, the decisions and actions are your responsibility and lie in your own hands, so psychomagic cannot merely make things happen for you. For instance, you cannot make somebody fall in love with you or you cannot make your boss promote you against their will, but you can overcome your own shyness and other things holding you back to make a strong impression on the beloved or your boss. In this sense, it is very similar to the practice of Tarot, where the cards do not say what will happen in the future but rather what you should do to have the outcome you desire. There is a significant difference in terms of locus of control here. Let me give a couple of examples taken from the book to demonstrate this. On the passage on how to regain trust in your own self, that is to repair the negative self-esteem you have, Jodorowsky suggests wearing dark metal glasses and walking around the block three successive times. This will literally show you that you can trust yourself! One of my favorite pieces of advice pertains to kleptomania. Jodorowsky claims that the desire to steal objects is fueled by the need to confess one’s deed and may be due to an unresolved and harmful case of sibling rivalry; one wishes to steal outside objects to win back the affection one’s supposed rival receives. The solution? Print out a card that states your nick-name used during your childhood and identifies you as a "child thief." In it you also say that you could have chosen to steal this given object but refrained from doing so. You have succeeded and now ask the person to love you. Then physically put this card next to one specific object you had the desire to steal. Another one I quite liked was directed towards those who had their childhood "stolen" by either parents or certain circumstances or both. Jodorowsky then advises the client to take a sizable amount of money and go to the casino to lose it all. You cannot leave the casino until all the money is gone; if you happen to win, keep on playing until you go home empty-handed. One of the surprising things I also learnt is the fact that names matter more than we think. For example, if you have the name of a famous writer or composer, it creates a lot of subconscious tension, especially if you are yourself involved in the creative arts. In that way, you will feel an immense burden and pressure to do well but will not able to match the quality of work that your name represents. The same applies to names, such as Mary, which is symbolic of the Virgin in Catholic belief and it creates not only the pressure on the person to be virtually a saint in life but will even extend itself to her child that needs to be perfect, namely, the child of God! This book has also helped me in terms of parenting. We as parents often put undue pressure on our children with ominous warnings. If you do not study, you will become homeless; or you need to have a good job or else you will not be able to have, let alone provide for, your family, or worse, when we tell our children they will not be successful in their desired professions. The problem is that these predictions could (and often do) become self-fulfilling prophecies! Instead, rephrase your words and reward the good behaviors in lieu of badmouthing the ones you do not approve of. But overall, one should be as open-minded as possible and give our children room to grow and live their dreams. In sum, what this book has showed me is that my fear of failing in my endeavors harks back to a time where I was told all the things I would not be able to do or accomplish supposedly. I had a hard time dealing with criticism; whether it was from home, my wife, or from work, a supervisor, it was nothing but the echo of my parents chastising me and setting me up for future failure. Yet the most beautiful thing about psychomagic is that once one realizes this, one should not (and often does not) hold a grudge but one understands and forgives. Because the perpetrators themselves - those who hurt must have been feeling hurt themselves - might not have realized the pain they inflicted upon others, be it their children or their fellow human beings. In that sense, with realization plus action that promotes overall well-being, one can achieve true healing. In fact, when you heal yourself, you are ready to heal others, and in turn this comes back to you more than tenfold. Thank you, Alejandro Jodorowsky from the bottom of my heart for this wonderful book and this unique and wonderfully odd but effective psychological practice!